The outstanding 6 Star certification recognises “World Leadership” at its Pietermaritzburg-based factory for its sustainability practices in all aspects of their plant and carpet manufacturing operations. The Green Star SA – Existing Building Performance (EBP) rating tool is the foremost programme focusing on whole building operational performance over 12 months, measured against eight key criteria for human and environmental health. For the first time ever, this EBP tool was customised to cater for the certification of an industrial facility in order to evaluate Belgotex’s factory. It was adapted by expert green building consultants Ecocentric, who together with the company’s comprehensive historic operational data and dedicated onsite sustainability team, accelerated the process and enabled the company to achieve their certification in just eight months. Extra credits were earned for Innovations which saw the company adopt several new eco-innovative production processes and product development strategies. Innovative raw material input strategies were implemented to reduce energy and raw material consumption, minimise waste, and allow the company to develop products with higher recycled content. The adoption of a water-less yarn dyeing process saw the complete switch in production and product development to solution-dyed ranges which resulted in 100% reduction in water consumption, as well as reductions in chemical and energy inputs in this process. Replacing wet space-dyed processes and products with solution-dyed ranges not only reduced water consumption and chemical waste output, but also improved the stain-proof characteristics of their carpets, offering superior colourfastness and fade resistance to its customers. The acquisition of a R5-million recycling machine enables Belgotex to recycle waste fibre and yarn back into production, effectively reducing the waste rate from their carpet production processes to close to zero. This machine also offers up to 20% energy savings, resulting in lower production costs and reduced CO2 emissions. The raw materials for several eco-products are derived from post-industrial and post-consumer waste, such as Green underlay and the new EOSBac backing system, as well as various carpet ranges. Their bestselling Berber Point 920 commercial carpet and other needlepunch carpet products are made with a blend of polypropylene and recycled Eco Fibre or Eco Yarn. This Eco-fibre is manufactured using post production waste, which is re-pelletized (utilising the cutting edge Erema recycling machinery). The input of this recycled content into their production process considerably lowers the embodied energy associated with virgin raw material use. 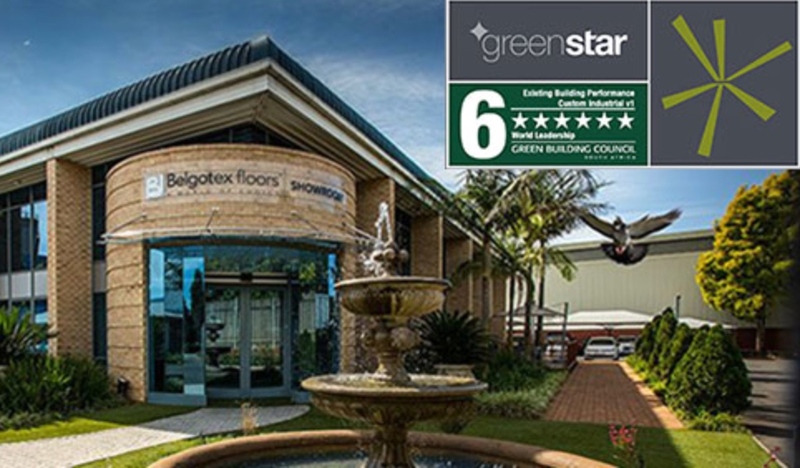 “GBCSA congratulates Belgotex on their 6 Star rating and on embracing green building practices, leading the way in creating more sustainable industrial facilities in the country, as well as for having this rating independently verified through the country’s leading authority on green buildings,” says Manfred Braune, chief technical officer of the GBCSA.